Free printable fun lunch box notes are sure to add some smiles to your child's day. When I was a kid, I suffered from a chronic condition. My mom called it "school-itis." I was a bit of an anxious child so getting ready for school often involved tummy aches and pleas to stay home. My parents were amazing to help me through it (check out how they inspired me to help my own kids with worries here). One of the things that my mom did was write a little message on my brown bag lunch every day. She knew it would make me smile and remind me that she was thinking of me throughout the day. Even though my kids have traded in the brown bag for lunchboxes, I still like to keep the lunch note tradition alive. That's why I've become a huge fan of printable lunch box notes. We've created quite a collection of notes for holidays and every day, and I'm super excited to add these fun lunch box notes to our rotation. 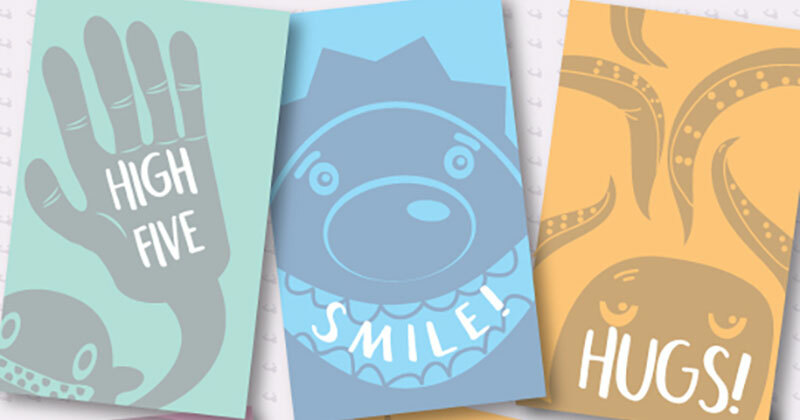 These silly notes are sure to make your kids smile too! Some days my boys need encouraging lunch box notes, but most days I like to just send them a quick note to make them smile. 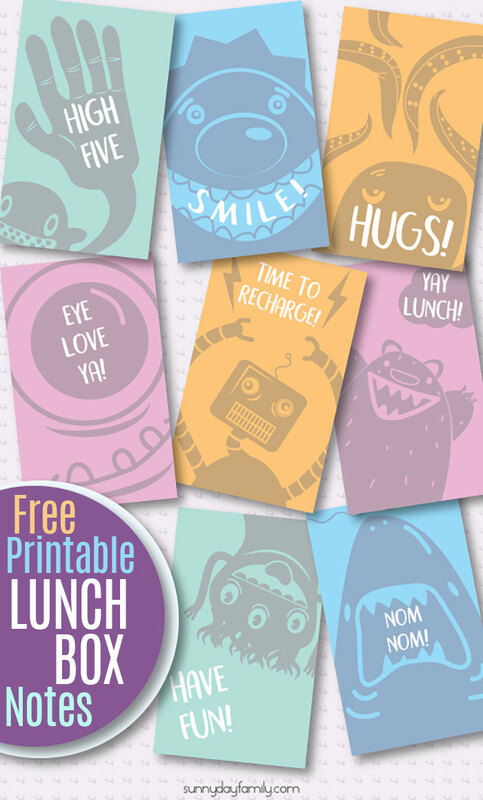 That's what these fun lunch box notes do - with silly monsters, robots, animals and happy messages, they are sure to brighten your kid's day. These notes are perfect for any day your kid needs a bit of fun in their lunch box. Use them as a mid-week mood lifter, a Friday pick me up, or just because. And you don't need to limit them to lunch time! Slip one in their pencil box, backpack, or inside a favorite book for a fun surprise. You can download these fun notes for free by clicking the button below. You'll get a 1 page PDF file with 8 unique designs. I recommend printing on card stock for best results. Simply download, print, cut and you're all set! Love lunch box notes as much as I do? 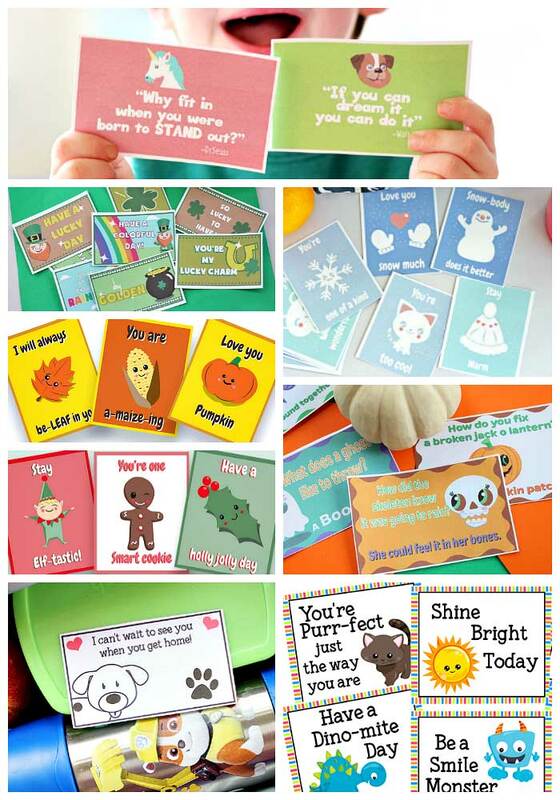 Browse our entire collection - over 60 free printable lunch box notes in all. You'll find holiday notes, seasonal designs, and even a set from the dog. Click here to see all our free printable lunch box notes.